around. 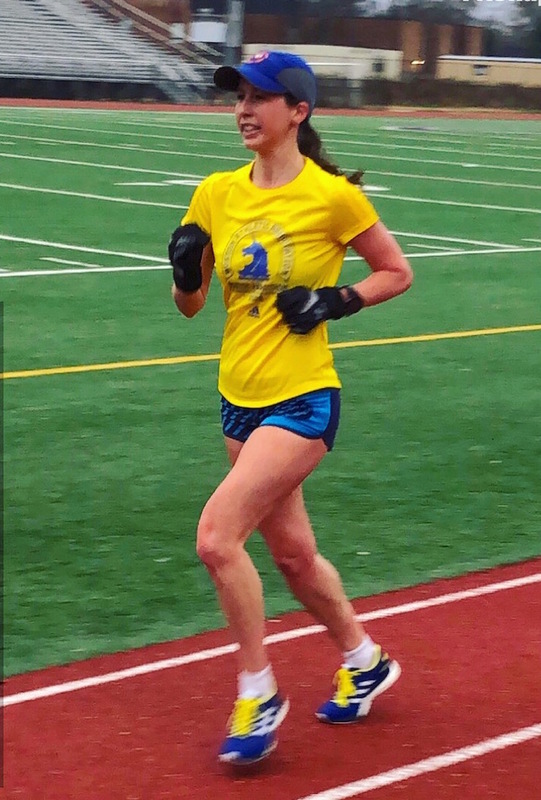 I nailed a workout with 8 tempo miles in it, I ran my first sub-20 5K ever (PRing by 19 seconds), and I felt amazing during a 22 miler that included a hefty amount of speed work. I need to remember that fitness gains aren't linear and performance is dynamic. It can feel like a plateau for months, only to see a large jump all at once. And you never never know if your body will be up to performing on race day, despite your fitness level. The Rehoboth Beach marathon is now six days away, and I'm in full-on weather stalking mode as well as anti-germ mode. I check the forecast 3-4 times a day, and wash my hands about 7-8 times a day (I touch a lot of door handles at work). My coach told me that he thinks that once you are in great 10K shape, it only takes six weeks to get into marathon shape. Because I had been so sick over the summer, he didn't want to ramp up the intensity too soon. Furthermore, our summer lasted through mid-October so I wouldn't have been able to handle much until that time anyway. I specifically chose Rehoboth Beach so that I would be training in cool weather and not risk getting sick. My first long run was on October 27th-- just six weeks out from race day. It was an 18-miler at an average pace of 8:04. Prior to then, my longest run had been only 15 miles. Five weeks out, I ran 20 miles, and then came the Richmond Half Marathon. 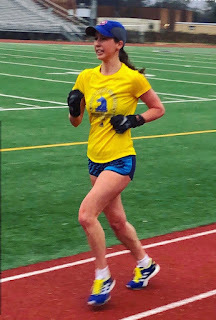 I'm not someone who likes to run more miles after finishing a half marathon, so I ran 14.1 miles that day if you include the warmup and no more. 3 weeks out was when I attempted a 22-miler, but bonked, having only made it to 17. And finally, 2 weeks out, I completed a 22-miler at an average pace of 7:59 (including 6 tempo miles and some intervals). As I said above, that final 22-miler restored my confidence in my fitness and my ability to run my goal time. Speaking of long runs, I ran all of them at slightly faster than easy pace. I typically started at around 8:30 and then progressed to 7:45 in the final miles. I actually started doing this in early October, when my long runs were only 14 miles. It sounded hard on paper but every time I went out for a long run, the progression always felt really natural. And it made the average pace of 8:05 feel comfortable. This approach makes me want to start my marathon at 20 seconds per mile slower than goal pace and finish it at 20 seconds per mile faster, but I probably won't be that dramatic in my progression. Speaking of marathon pace, I haven't done any marathon pace work this cycle, which is a change from the past. Does that make me nervous? Not really. I think the main benefit of training at race pace is mental and getting your body used to how that feels. I think the other training I have done has benefitted me more from a purely physical standpoint. I can comfortably run in the 7:40's at the end of my long runs without feeling like I'm straining, so I think the 7:20's is still a good target. Originally, my coach did plan for me to run marathon pace miles in my last 22-miler. However, he changed it to a run that included 6 tempo miles instead + 3 miles of intervals. All of that was faster than marathon pace. The chart above shows my weekly volume. There are a few valleys due to tapering for tune-up races, and I was sick for three days in October. Even though I set a new weekly mileage PR, this volume is not as consistently high as my training for Boston. But, it's close. My Boston cycle was longer and my only tune-up race was six weeks out. No Turkey Trots, either! So I had more of an opportunity to log really high mileage. 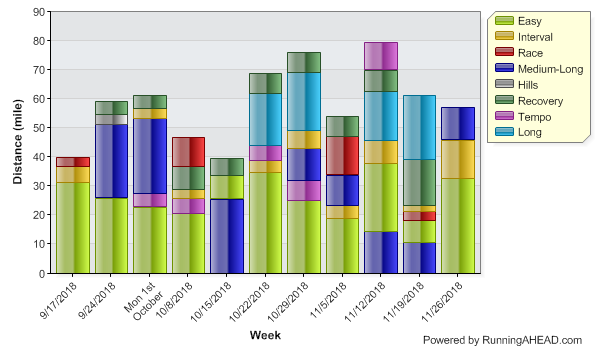 Optimizing a training plan is really just one large experiment. My coach changes things up each cycle to see how I respond, and I appreciate the variety. I was extremely happy with how my Boston cycle went, whereas this one had a few more hiccups. So, while this cycle didn't go perfectly and was on the shorter side, I do feel prepared for the marathon. The last three weeks of training went really well, so I just need some fresh legs to execute on race day. I'm still on Cloud 9 with my sub-20 5K, so I've already realized one really strong outcome. My exact goal and strategy is going to depend on the weather. Right now, I'm looking at sustained 13 mph winds out of the north with temperatures in the mid 30's. This means an extra slow start for the first 6 miles (maybe 15 seconds per mile slower than goal pace) and then being prepared for a difficult/slower patch during miles 20, 21, and 22. Combined with the crushed gravel trail that we run on during those miles, I need to mentally prepare for a tough stretch. But with wind from the north, I should get a nice tail wind during the last 4 miles. My goal pace is 7:25 for a 3:15 marathon, in ideal conditions. If the wind is a noticeable factor, I might be looking at 3:17, which is still really strong. And, if I'm having the race of my life, I don't think 3:12 is out of reach. So. . . I expect (and hope) to run between 3:12:00 and 3:17:59. In other words, I want to PR by at least four minutes. I'd also like to place in the top 3 for the Women's Masters division. I think they only give an award for first place, but my personal goal is to be in the top 3. I look forward to writing a detailed recap next week at this time! Well it is clear you are definitely in high-end conditioning to race a very fast marathon. Not familiar with the "10k-shape" as a base attribute of marathon training, but I like what this Coach does and creates for your training cycles - he obviously knows you well, how you respond, and what to be careful of. 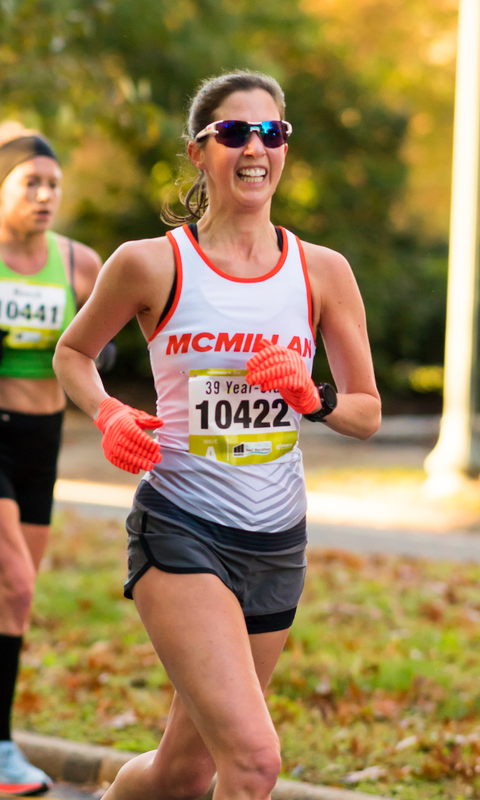 The "driving-nail" in characterizing your conditioning is that last 22-miler 2-wks out where you start slower, then progress to faster and when you can do those faster-than-race pace routines in last phase of LR, it says you got everything working for you to race this marathon really fast! I like your strategy to start at 8:30, and segue by feel into race pace. Take it in stages and check-in with your inner self every 10k and run it by feel, and not what the split is each mile. You got what it takes to race this marathon fast! Good luck! Good luck (with the weather; you won't need it for the rest)! I think you'll do great, and I look forward to your recap. I like how well you've defined your goals: gives you a basis for race strategy. I'm interested to see how the short training cycle goes. That is much more typical for me - the long training I've done recently is not what I'm used to. What makes me think you're in peak shape is the long run with tempo work - that's a tough distance workout, and you nailed it. You're definitely ready for a PR! Now we just both need to cross our fingers for better weather - looks like both races may be windy!